There was a time when buying a phone on contract was an economically wise decision. Your phone supplier subsidized the cost of your phone and in return they got some loyalty from you. Things have changed in the last few years. Now, as I am often horrified to find out, it is often more expensive to buy a phone with a contract than one on its own in addition to a SIM only deal. Vodafone are looking to buck that trend. They have released the Vodafone Smart Ultra 6 (another ‘new’, or rather old, as we hardly see phones branded with the vendor’s name these days), which comes with some pretty impressive features and and even more impressive price. 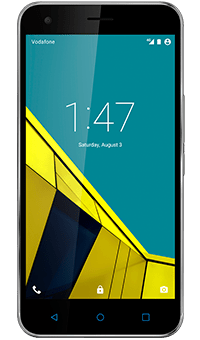 At only £125 on PAYG (or £17pm on Pay Monthly), this phone packs in a full HD 5.5″ display, 13MP camera, Lollipop and a Quad Core 1.5GHz processor. I recently attended a Vodafone’s social event, where I managed to talk to some of the people on the ‘inside’. They talked about this phone with great pride, and more so, they talked about the philosophy behind the phone. In a way, this phone to them was what we are hoping to get from Google’s Ara. Let me rephrase. They basically wanted the best of everything, in the lightest, smartest and cheapest possible package. This isn’t just another phone that was pushed out. Vodafone worked with their supplier, and in doing so, they believe they are on to a winner. You will not be blamed if you thought this was an iPhone (from a few years ago) look alike. It has a similar touch and feel to the iPhone, though it lacks some of the more distinctive features, and of course, it has a micro USB port at the bottom rather than one of those ‘other’ ports. The front features the screen, which is pretty good by the way, and a front facing camera and your speaker. A silver bezel surrounds the phone, and the back shows off the Vodafone symbol, the word 4G, and other ratings. It also shows off the camera and the flash. The bottom has the micro USB port and the microphone, while the sides have ports for SIM and micro SD (either sides), and volume and power keys. There is a 3.5mm port on the top. The bottom features the Home/Back/Recent App keys in the form of hardware buttons, which glow blue instead of the usual white. The home key, which glows blue, also acts as the ‘LED’ that we have become used to in Android phone. It blinks to let you know of notifications, while it pulses softly when on charge, and fully when fully charged. This was probably one of the more clever and cool features packed into this device. The OS is almost bare Android, apart from the Vodafone packed apps. This means that you get a good raw Android 5.0 experience, without any of the overheads most phones pack these days. The result? Smooth and fast operation. This was evident on daily usage as well as when playing games. A 5.5″ screen is no ordinary matter. If the resolution isn’t right, a screen this size only highlights the bad. Vodafone have once again done well. The screen looks good, the colours are realistic and there are no signs of pixelation. It is a great screen for watching videos, or try out the Vodafone Sky Sports app. While I haven’t included any sample images, the camera was pretty decent. It won’t blow you away, it isn’t the best one out there, but quite frankly, unless you are a photographer who is really fussy, it ticks all the boxes. Now this one is pretty impressive. Vodafone threw in a 3000mAh battery, and to be honest, you need that for a screen that size. Result? An easy performance through out the day, and if used carefully, it even gives you a 2 day battery life. More information on the Vodafone Ultra 6, as well as buying options, are available on the Vodafone website. It retails for £125 on PAYG and starts from £17 for Pay Monthly customers.